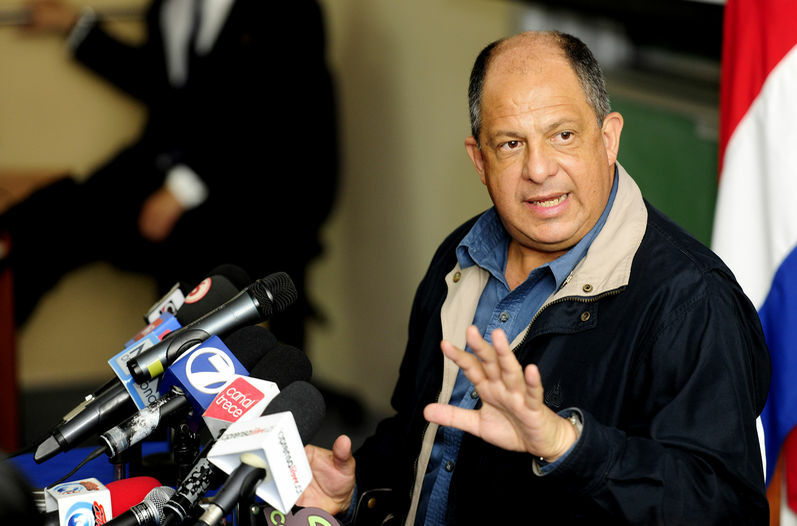 QCOSTARICA – President Luis Guillermo Solis took a strong position on Monday, saying “nobody has to tell me to evaluate it”, referring to the future of his Ministro de la Presidencia, Melvin Jimenez. “Neither Mariano (Figueres), nor Victor Hugo Morales, and Alexander Mora (Minister of Foreign Trade), and Sonia Marta Mora (Minister of Education), and the Chancellor have to remind me what I have to do,” said the President. Solis made the aggressive assertion in response to questions from La Nacion over the request by Mariano Figueres, head of the country’s intelligence service, the Dirección de Inteligencia y Seguridad Nacional (DIS) and PAC legislator Victor Hugo Morales, to not dismiss Jimenez. The possible removal of Jimenez, who holds the position akin to the Chief of Staff in the U.S., follows allegations by former deputy minister of Telecommunications, Alan Ruiz, in the “gag law” scandal – the draft law allowing the government to punish radio and television station for inappropriate content. Under the draft proposal the government would have the power to censure content and threaten closure to offending stations. The scandal cost the minister of Science, Technology and Telecommunications (Micitt), Gisela Kopper and Ruiz their jobs last week. And may now cost Jimenez his job after allegedly offering Ruiz an ambassadorship in return for his going out quietly (resignation). But, this is not the first time Jimenez has made such an offer. If you will recall the Attorney General Ana Lorena Brenes case several months back, when deputy minister de la Presidencia, Alan Soley, made the same allegations by Jimenez. Soley also resigned and a Legislative committee hearing was inconclusive. Solís changed his story on Monday over knowing about the draft legislation. Last week he affirmed having no knowledge of the draft text, yesterday saying he knew of the draft proposal, but had not read the text. The President added that, to leave no doubt on the government’s position on freedom of expression, he will appoint a panel of three prominent citizens (“notables”) to work on the draft bill to remove all traces of obstacles to the freedom of the press and expression in the country. The panel is to be made up of two men and a woman, whose names will be announced later this week and who will report directly to the president’s office. Luis Guillermo Solis reiterated that in the next three weeks he will be working not only on his report to the Legislative Assembly, due on May 1 of each year, but on a restructuring of his cabinet for the second year of his government, that would include the creation of a Ministry of Communication. The President, however, would not speculate on which of his ministers would be leaving.